On Jan. 30, the Bulgarian government promulgated Decree 40, which, among other things, allows the security services to gather from each internet user the data about who they have written to, who is on their contact lists, what instant communication agents they are equipped with, when they used them and the precise manner of using them. Institutions attributed the act to the requirements of Directive 2006/24/EC , but the majority of internet users in Bulgaria interpreted it as an encroachment on their civil liberties. The civil initiative Electronic Frontier published on the internet a petition  (BUL) against the decree, signed by over 1150 people already, and a number of Bulgarian bloggers put banners to support the campaign on their blogs. 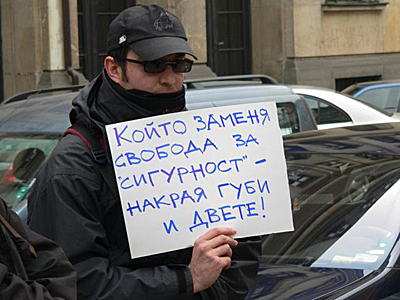 On Feb. 7, Electronic Frontier organized a protest  in front of the State Agency for Information Technologies and Communications (SAITC) in Sofia , the capital of Bulgaria.